We left Ecuador and the Galapagos with about 6 month's worth of food. We hadn't expected to spend only 4 months in French Polynesia and then fly to the States for 5 months in the fall. 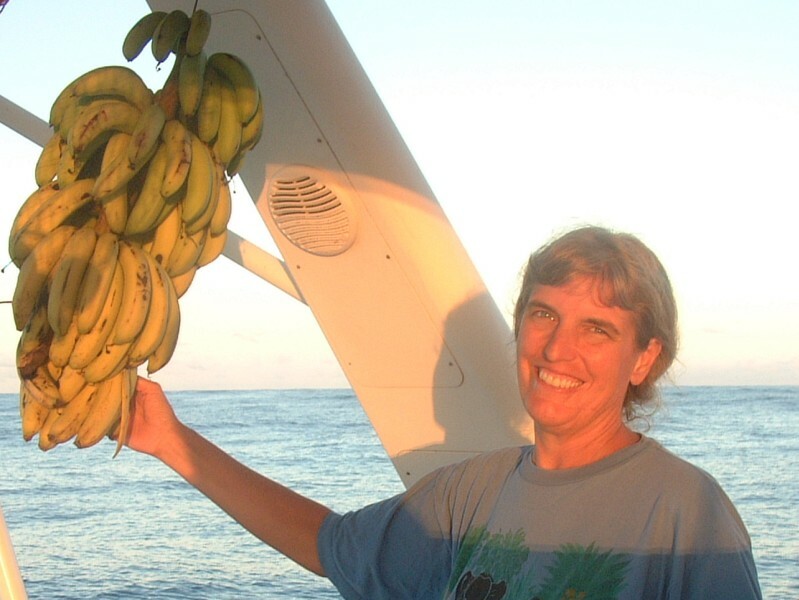 So when we returned to Ocelot in January 2004 we still had lots of food on board. Here's what kept and what didn't: Anything we had vacuumed bagged was in great shape if the vacuum held. That included sugar, flour, whole wheat flour, corn meal, shelled nuts (peanuts, walnuts, pecans) some of the cat food, rice and couscous. Of course plastic or glass containers of peanut butter, syrup, pickles, wine, etc. all did fine. What didn't survive were crackers (even double packaged), cereals, chocolate bars (darn! ), spaghetti (it tended to rip through the vacuum bags allowing weevils to take over), dried beans (they molded, even though they looked good before cooking), some cans that rusted in the moist air, oats in original packaging but not vacuum bagged, and any pasta in cardboard boxes, even if it was well within its pull date. To our dismay the cockpit drains plugged up with cat hair (Arthur guarded the boat while we were gone and continued shedding) and water got into the lazarette storage areas. Some of the big plastic storage boxes were not water tight and we lost 120 cans of Panamanian beer. Cleaning up was not fun, and we sure didn't want a beer when we were done! Because we spent more than 3 months in French Polynesia after our return from the States, we had to do what we had hoped not to - buy lots of food here. So, here's what we've learned, and I hope this helps other yachties coming from the Americas. Certain foods are subsidized by the French government and they are as cheap as anywhere else we've been. For example flour is US$0.90 a kilo (about 43 cents a pound), baguettes (a French staple) are 43 cents each, dried beans are 80-90 cents a bag, pasta can be found for less than $1 a pound, and carrots are the cheapest fresh veggie at $0.90/pound. Some canned foods, like tomatoes and tomato paste, green beans, etc. can be found at about $1/can, but you have to look for sales. We found canned tomato sauce for 33 cents a can, on special, once. Much food comes from New Zealand, and with the exchange rate in our favor, we found butter at about $2 a pound, and powdered whole or skim milk at the same prices we've seen throughout the Americas. Fresh beef and pork and NZ leg of lamb were all at reasonable prices. Cheeses (French and Dutch) are on a par with USA prices on the West coast: $4-5 a pound for Brie (although you can pay over $8/lb), Gouda, Edam, and Emmenthaler. Things like feta and more exotic cheeses come in at over $13/pound. Powdered milk has been pretty standard at about $10 to $12 per 2.5 kg can. The really pricey things are wine (yes, even the French wine), eggs ($5/dozen in the Marquesas, but only $3.50 in the Societies), cereals and oats (over $6/med size box), fresh local chickens (can you believe $17 to $25 per chicken? ), canned tuna ($1.80 per small can), and "exotic" veggies like broccoli ($5/lb), zucchini ($3.50/lb), and lettuce anywhere from $3.50 for a small head to over $7. Local fish can hit over $13/pound (yes, that's more than 2600 Fr. Polynesian francs/kilo), although sometimes fresh red tuna ("thon rouge") is on sale for half that (and it's GREAT)! Boxed juices are twice what we paid in the Caribbean (like $4 for 2 liters), so we've relegated non-concentrated juice to the "treats" list. We still use the bottled juice syrups we brought from South America. Despite the lush hills, lots of rain and sunshine, the local fruits are not cheap. Ten dollars buys a couple small cantaloupes, $2 for a dry coconut, $3-5 for 6 to 8 small bananas, $3 for a pineapple. Pumpkins can be as much as $4 or $5 each. Only the Marquesas was a fruit-lover's paradise, where the locals were more happy to give away the fruit than to sell it. But we are captive consumers when it comes to fruit, so we've spent lots of money on this staple of our diet. Water, by the way, is free for the taking ashore on all the islands except the Tuamotus and Bora Bora which have no ground water and must desalinate. Shopping in the French Islands means frequenting small shops (called "magasins") in any of the islands except Raiatea or Tahiti (which are the most populated) where you'll find big supermarkets -- branches of Champion (which we know from the Caribbean) and Carrefour. The latter is a megastore with electronics, household goods, sporting goods, and clothing. They have deli sections, fresh fruit and vegetable sections, frozen foods and toiletries. (Oh, by the way, you can't get quasi-medical things like cold medicines or aspirin in grocery stores - You have to visit the "Pharmacie" and even there you'll have to ask for what you want.) The big grocery stores in Tahiti and the rest of the Society Islands (including little Fare, Hauahine) all take credit cards. Some will take MC but not Visa, and vice versa, so be sure to ask. If you're willing to pay their prices, you can get just about ANYTHING you might want to eat or drink. Because of the large Chinese population, there's a variety of Asian food, as well. 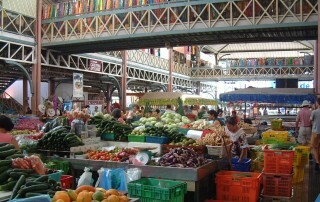 Of the local markets the largest is the "marché" in Tahiti, open everyday but Sunday. It's a huge two-story building with fish, fruits and veggies, and tourist items. There's a small fruit stand-market by the ferry on Moorea, and a few small stalls by the side of the road where families sell their extra pamplemousse, coconuts, mangoes, etc. In Huahine, the town of Fare (photo) has a market on Sunday morning at about 6am, which is closed in time for church. 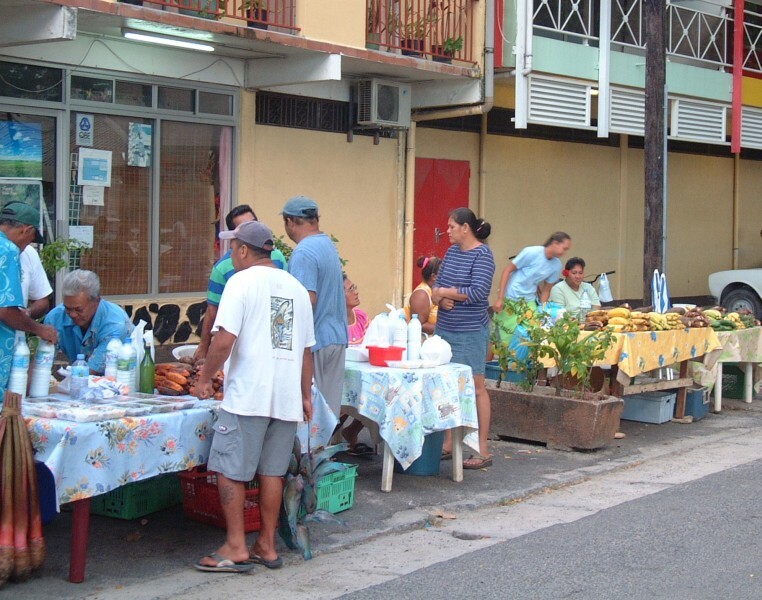 In Uturoa, Raiatea, there's an open-air cantaloupe market near the docks but most fresh food must be bought in the stores. We never found a central market on Bora Bora or Maupiti, but again we could by from individual families or in the little stores. Fresh fish in the big markets in Tahiti an the other Society Islands can be pricey, though some bargains can be found on fresh tuna. We've seen small tunas for sale by the side of the road in Moorea and Huahine, but given the need to keep the flies off and the fact that there's no ice in view, we didn't buy any. Fishing in the French Polynesian islands has been a disappointment. 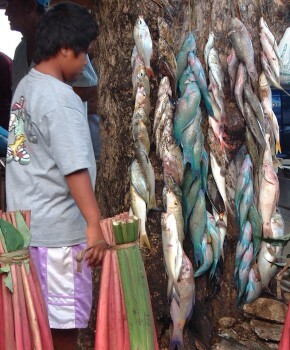 We caught 2 or 3 lagoon fish (types of trevally) in Makemo, an atoll known for its lack of ciguatera poisoning. Otherwise, our dual lines, with a variety of lures, and at many differing speeds have come up empty after hundreds of cruising miles. Maybe others have better luck, but most cruisers don't depend on fresh fish. We finally caught a small tuna just outside Maupiti on the way to Tonga. Yay! As for shell fish, the prices are out of sight in the big supermarkets for oysters, mussels, and clams. As for doing your own hunting and gathering: there's a thing called the commercial trochus shell, a form of top shell with pink and silver swirls on its base. Inside is a beastie akin to the Caribbean conch, but about half the size and not as tasty. Like the conch, it closes its door with a flexible operculum. Apparently some 43 individuals were first introduced to the islands in the 1940's, and have now spread everywhere. On some of our lagoon snorkels we swim over hundreds of them. They are not protected, but I suggest you try one meal (maybe 2 shells/person) and then let the others live. The shells are harvested for polishing and selling in the tourist markets. If you get a chance to buy pearl oyster meat it's delicious. Best bet would be to introduce yourselves to some pearl farmers (like in the Tuamotus) and ask if you can either help shuck the oysters or buy some frozen meat. The large spider conchs have meat akin to the Caribbean Queen conch, but they are protected on some of the Tuamotu atolls, and rare on other islands. They are also very difficult to extract from their shells whole and have hardly any meat. Are you nuts? Or are you rich? The only bargains we've found in prepared food are the baquette sandwiches for sale at little kiosks around the central market in Papeete. Ask for a "crous-coute", and choose one filled with chicken salad, crab (the best), chow mein (yes, complete with the noodles) or poulet-frite or steak-frite (which are chicken or steak sandwiches with French fries inside!) These filling lunches will set you back only $1.50 to $2.50 (150 to 250 CFP). Add a can of Schweppes grapefruit or lemon for another dollar-plus and take it all to the cruise-ship park next to the tourist bureau on the waterfront. There you can have a relaxing lunch watching the local families and kids at the fountain. Ice cream, in fresh tropical flavors, can be found frequently, but the best price was $1 for a single scoop cone in Uturoa, Raiatea. Elsewhere it may be double that. The best ice cream we found not on a street corner was at "Maison Blanche" at the eastern side of Huahine (we'd rented a car for the day). Flavors included pineapple, cantaloupe, soursop, mango, and coconut. Add a fresh Trade Winds breeze, lawn furniture under the shade of coconut palms, and a view of the eastern pass and lagoon. Yum.